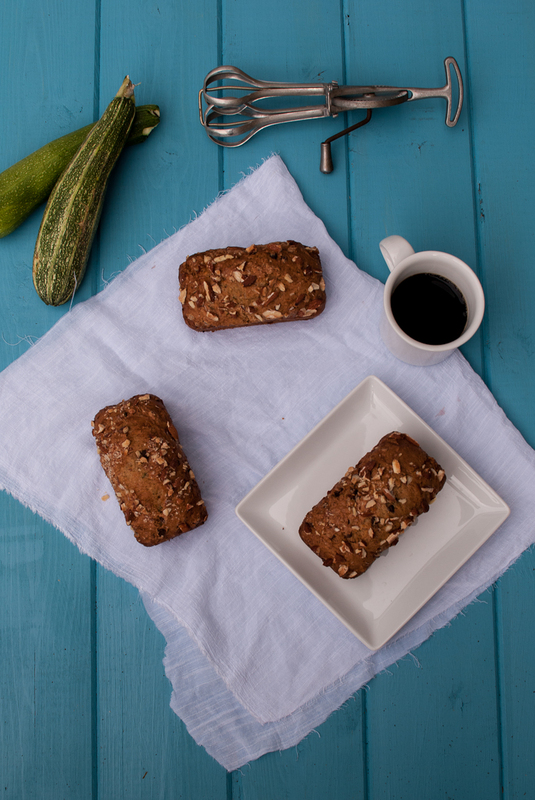 If you are like me, and have a zillion zucchinis from all summer in your garden, well you know the “old stand by zucchini bread”. 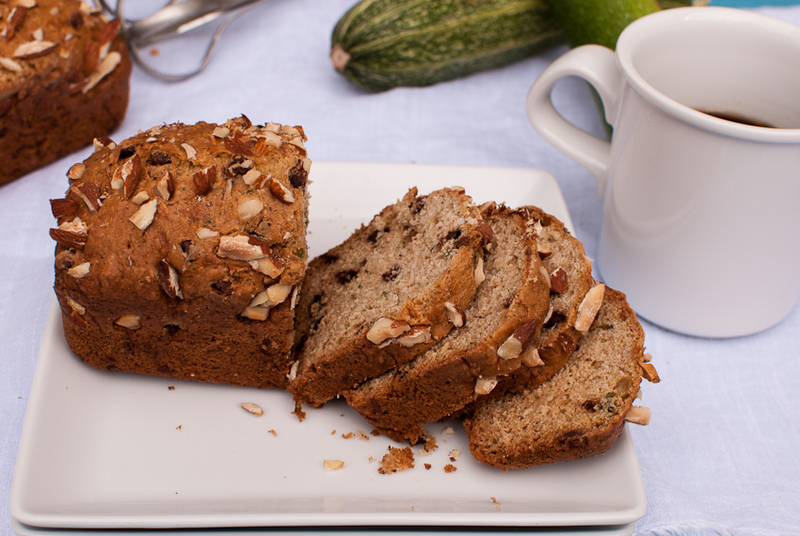 But this zucchini bread is lower in calories and fat. Using greek yogurt in place of oil and less sugar then the typical quick bread, lowers the calories and makes a very moist bread. The kids are back in school, summer is winding down, and the garden is looking a bit tired and picked over…but zucchini still keeps growing! All of our tomatoes are also ripening all at once! Yikes! What to do with 100’s of tomatoes? Well next weekend we will be making sauce and salsa! And while I have had the craving for all things pumpkin already, I’m still hanging on to the last few days of summer. It’s true, I love Fall, it’s soooo beautiful here in Oregon. The changing leaves, crisp cool mornings followed by warm afternoons….what’s not to love? We usually don’t see our first frost until almost Halloween! 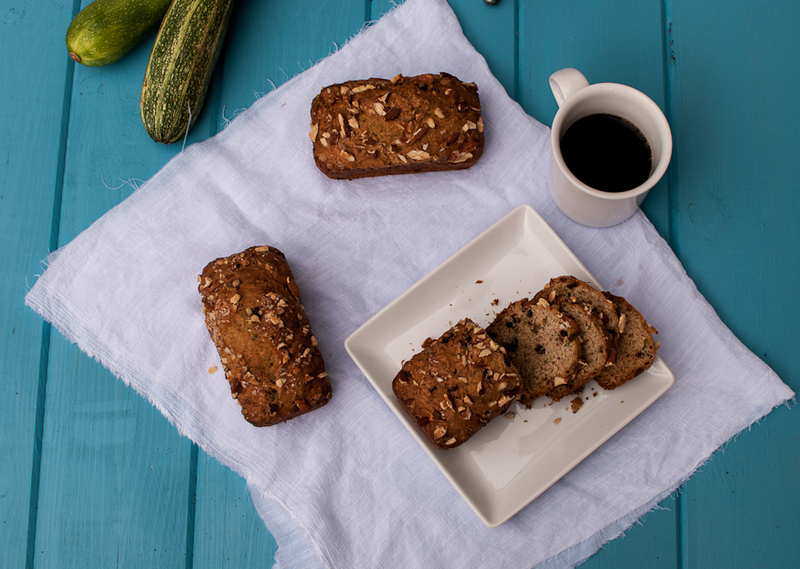 To take you into that Summer/ Fall transition….this zucchini bread is perfect with a cup of coffee or tea. Perfect for the cool mornings, have a slice or two and let the end of summer wind down. This recipe bakes up 4 mini loaves or 1 large loaf. I personally like the mini loaves, just enough to have for a few days and then it’s gone. I freeze the other loafs for when my zucchini craving kicks in during the winter months. In this last batch I threw in a handful of mini chocolate chips too (thanks to my daughter) and it tastes super yummy! Cheers to Fall and all the changes in the garden! Shred zucchini and mix 2 Tbsp of sugar in the zucchini. Set the zucchini in a strainer over a large bowl for 30 minutes. Toss the liquid in the bowl. Mix the dry zucchini with the yogurt and lemon juice, set aside. Preheat the oven to 375 degrees. Grease 4 small mini loaf pans with cooking spray or 1 large loaf pan. Whisk the flours, baking powder, baking soda, salt, all spices and 1/2 cup of the sugar together in a large bowl. Beat the butter and remaining 1/2 cup of sugar together in a large mixing bowl on medium speed, until light and fluffy. Reduce the mixer to low, beat in half the flour mixture just until combined. Followed by a third of the zucchini, then flour, then zucchini until all is mixed. Add the chocolate chips at this point if using. Scrape the batter into prepared pans, sprinkle nuts on top of batter. Bake for 25-30 minutes for mini loafs, and 55-60 minutes for large pans. Check for doneness by inserting a knife in the middle of the bread. Let cool on a rack for 10 minutes before removing. Freeze when cooled or store loosely covered. Yields, 4 mini loafs or 1 large loaf.